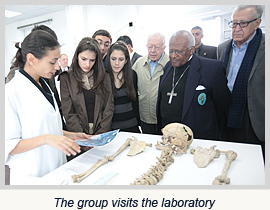 During the filming of their documentary on the search for missing persons in Cyprus, Desmond Tutu exchanged his views on remembrance and reconciliation with his fellow Elders and the young Cypriots travelling with them. For Archbishop Tutu, forgiving the transgressions of those you once considered the enemy is to bring peace inside your own heart. Decades after living through a period of terrible conflict, there are many families on the divided island of Cyprus for whom old wounds have not yet healed. I was travelling to an exhumation site in the Cypriot capital, Nicosia with my fellow Elders Lakhdar Brahimi and Jimmy Carter when 16-year old Michael asked us this question. Michael’s question was not easy to answer. Lakhdar Brahimi was quite adamant that he, for one, would not be able to forgive a person who had killed a member of his family. I was forced to challenge my friend. It is true that we should not forget – remembering is very important in guarding against further tragedy and in teaching our children the lessons of history. But forgiving is not the same as forgetting. Forgiveness does not come easily and it may take a very long time. From my experience in South Africa and many other parts of the world where people have suffered terrible losses, I have come to understand forgiveness as a difficult and often painful journey. And yet I am continually amazed by our ability and willingness to submit to this painful process. It is as though we instinctively know that by acknowledging the humanity of all people, even those you once considered the enemy, it is possible to bring peace inside your own heart. The alternative is a harsh one. It means living with bitterness and animosity, making it very hard for any society to grow and flourish. In Cyprus I hope that in time families will be able to see something of their own struggle, their own tragedy, in the other. I hope that they can say, ‘Yes, I have suffered. And those people on the other side: they have suffered too.’ Even more importantly, ‘We must make sure that in the future nobody else suffers as we have done.’ On this, Lakhdar and I are in total agreement. In December 2009, we Elders were in Cyprus to film a documentary about a very difficult and painful issue: the thousands of missing people from both communities, many of whom have been missing for more than forty years. Their families never discovered what happened to them – they never had a funeral at which to grieve, or a grave at which to lay flowers. We visited exhumation sites, where scientists from the Committee on Missing Persons dig the ground and sieve through mud to look for these missing people. We also travelled to the laboratory where their bones are carefully documented, reassembled and DNA-tested until finally they can be given a name. These scientists, who came from both north and south to work together, were not setting out to find people to blame. Instead, their efforts go into answering the burning questions in the minds of all the families whose parents, brothers, children, were lost. Where is my loved one? How did he or she die? At last, the family is called and the remains returned to them. For the first time, they can see the physical evidence of their loss; they can ask what happened and find out how their loved one died. For these families, this can bring the closure they have sought for decades. In the film, you see us meeting two men – one Greek Cypriot, one Turkish Cypriot – who found in the loss of their fathers a common experience. These two remarkable men have taken this tragedy that they share, and used it to promote understanding between their two communities. To see the young people listening to and learning from their own elders was very moving for us. Cyprus remains a divided island, but there are many working hard to try to find a solution that will end the separation of the two communities and, I hope, allow the wounds of the past to heal. On this journey, we discovered that some of those longing to end the division of their island are only teenagers themselves, too young to remember the conflict but old enough to understand the painful memories of their families and communities. It was such a privilege to spend time with these impressive young people, so wise beyond their years. They can see the need for a deeper understanding of ‘the other side’, and an acknowledgement that both sides have suffered. They see that a shared future means a shared past. The documentary film Cyprus: Digging the Past in Search of the Future will be broadcast on television in Cyprus later this year. 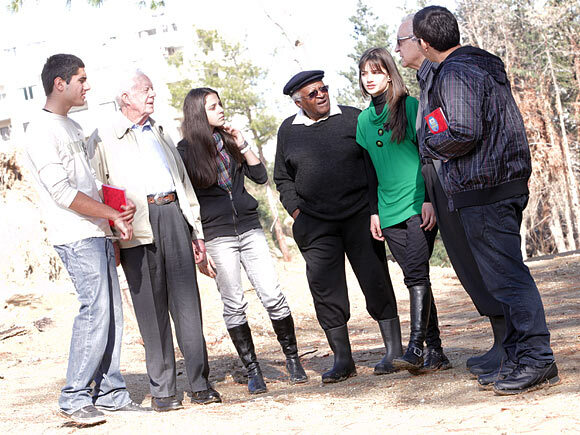 Ahead of the launch of The Elders' documentary about the search for missing persons in Cyprus, Desmond Tutu and the Cypriot teenagers in the film speak to the Cyprus Mail about memory, forgiveness and reconciliation.